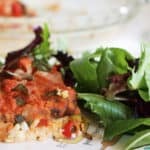 Cauliflower Crust Pizza-gluten free and delicious any time of day. Preheat oven to 375 degrees. After cauliflower is completely cool, place it in clean cotton kitchen towel and squeeze all remaining water out of it. Mix cauliflower, egg, salt, minced garlic and goat cheese in bowl--make sure texture is smooth and lump free. Using a 9" round pan for thick crust, or 8x13" rectangle for thinner crust, lightly brush olive oil on bottom and sides of pan. Press cauliflower mixture into pan, making certain that it is evenly spread. Bake crust for 40-45 minutes or until crust is golden brown. After removing from oven, spread pizza sauce on top of baked crust. Evenly distribute vegetables and herbs--here we have chosen mushrooms, onions, red pepper, pineapple and basil, but you can use any vegetables or herbs that you like. 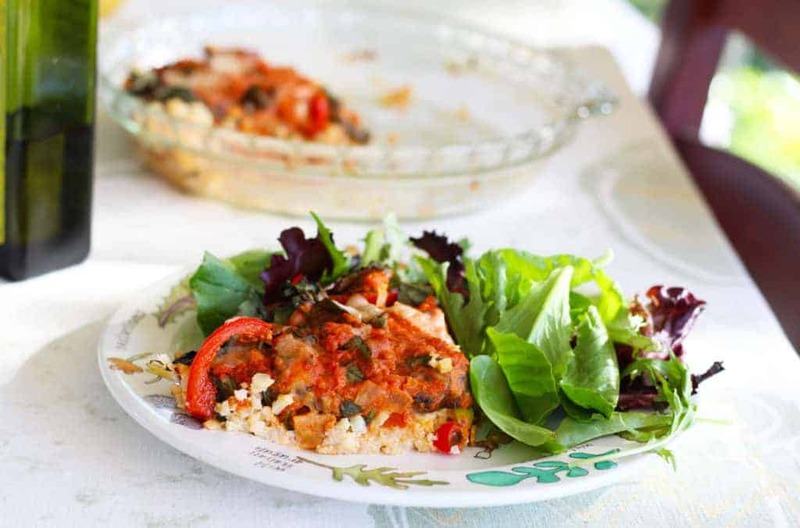 Return pizza to the oven and bake for an additional 10-15 minutes, or until vegetables are cooked. Add all ingredients into baking pan. Bake for 30 minutes at 375 degrees. After cooling, blend beets in small blender. Top pizza with beet hummus.